One man, one goal, One mission. One Ginger God with one vision. 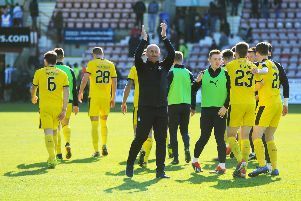 Peter Houston is unwavering in his ambition, which is the same as it was when he arrived at Falkirk two years ago – return to the Premiership. The Bairns boss has taken the club he represented as a player through two exhilirating seasons, but he has still not fulfilled the objective he set himself in June 2014. There have been cup finals, play-off finals, last-gasp winners and giant-killing. But Falkirk remain in the second tier of Scottish football and the task ahead is as difficult as it has ever been with Dundee United and Hibernian viewed as their likely challengers for the Championship title. However, after a season where his side exceeded all expectations – even after reaching the Scottish Cup final in 2015 – the Bairns boss is committed to finding a way to restore the Bairns back to the big-time which they have been missing since relegation in 2010. Revamped cup competitions – new entrants in the Irn-Bru Cup and new sections added to the BetFred League Cup have provided additional interest to the early part of the season, but there’s only one thing for the man the Bairns fans call ‘The Ginger God’. “Top of my agenda is again getting out this league and going one better than last year,” the Falkirk boss told Game On. “The new format of the league cup is exciting, I’m not against it at all but the game on Saturday, August 6 is the main thing in my head I’m building towards. The Championship has three new teams from last season’s schedule. With Rangers moving up and both Livingston and Alloa going down to League One, they have been replaced by big-spending Dunfermline, Ian McCall’s Ayr United and Houston’s former employers Dundee United. It looks at least as competitive a competition as it was last term, if not more so. The Bairns boss agreed. But he also exuded confidence that his side could challenge, just as they did against the odds last season. “The league is going to be stronger. No disrespect to Livi or Alloa but Dunfermline and Ayr will be stronger... but it’s up for grabs. Houston has recruited shrewdly in the close season, swiftly adding a player from each of the teams who have been in or around the play-off picture over his two years in the Championship. Lewis Kidd has come in from Queen of the South, while the Bairns have landed two coups with goal-scoring midfielder James Craigen moving from Raith Rovers on a pre-contract agreement and Morton fan favourite Luca Gasparotto switching to the Bairns before pre-season training began. “I spoke to him (Luca) at the end of the season,” Houston admitted. “He wanted to come so it was easy to set up, but with him going over to Canada for the internationals we had to wait and wait on his release from Rangers to sort things, but it was in the bag a while ago. He came over we got the signing through and all done quickly. The return of fan favourite Danny Rogers completes the Bairns headline signings, which are also boosted by Nathan Austin’s full-time move to the Bairns after his loan deal with East Fife expired. It’s all in place for the Bairns ahead of the big kick-off and, what Houston and all Bairns fans hope, will be the fulfillment of the manager’s ambitions. Houston added: “I’m looking forward to start the season, Hibs had a cracking season and got the monkey off their back with the Scottish Cup and had a remarkable season getting to both national cup finals and finishing third so I’m sure down Easter Road way they’ll be looking to improve.